Is Object Found By Satellite the Vertical Stabilizer (Upright Tail) of Malaysia Airlines Flight MH370? 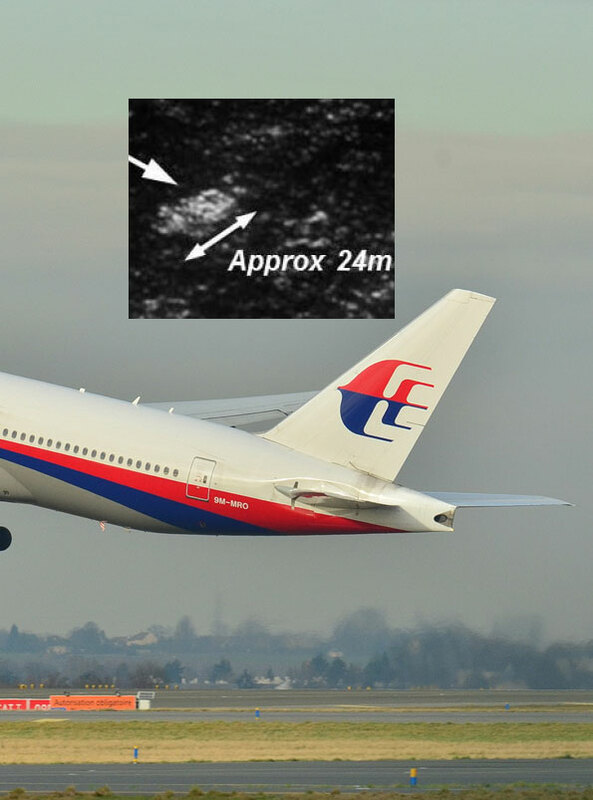 Is there a resemblance in the comparison of an object found by satellite imagery in the southern Indian Ocean, and the vertical stabilizer (upright tail) of the Malaysia Airlines Boeing 777-400ER? The object is estimated to be 24meters in length. According to Boeing, the height of the vertical stabilizer from ground to the tip is specified to be 18.5 meters. The Australian Maritime Safety Authority (AMSA) reports it has received an expert assessment from commercial satellite imagery of objects may indicate a portion of a “debris field” from Malaysia Airlines Flight MH370. Objects were detected floating in the ocean about 1,500 miles (2,500 kilometres) south-west of Perth. Four Australian search planes, as well as search aircraft from the United States and New Zealand, were sent in the last several hours to the area of the southern Indian Ocean. 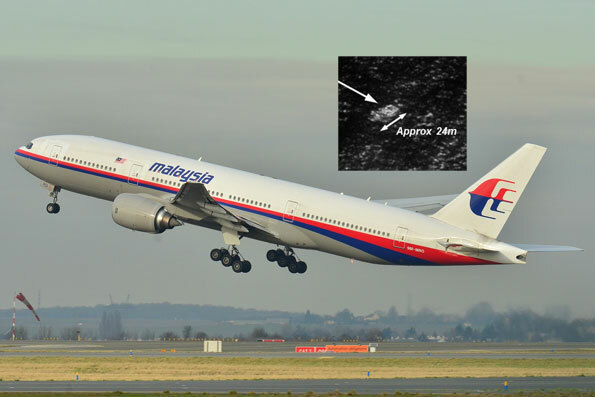 Zoom-in to image of object compared to a photo of the actual Malaysia Airlines Boeing 777-400ER (9M-MRO) uploaded by “russavia”/LaurentERRERA with free license on Wikipedia. In the evening with darkness settling in, AMSA said there was limited visibility in the area and upon arrival into the area, the crew of an RAAF P3 Orion in the search zone had been unable to find any debris. “RAAF P3 crew unable to locate debris. Cloud and rain limited visibility. Further aircraft to continue search,” reported an AMSA tweet. At a press conference earlier today, AMSA’s John Young said the images indicated that one of the objects measured around 24 metres in length. AMSA’s John Young emphasized that the objects may be difficult to locate and they may not be related to the search. Malaysia Airlines Flight 370 (MH370/MAS370) was a scheduled international passenger flight that disappeared on March 8, 2014 en route from Kuala Lumpur International Airport to Beijing Capital International Airport. The aircraft operating on the flight was a Boeing 777-200ER that is believed to have suddenly changed heading from north to south, southwest, west or northwest. The last contact with air traffic control was less than one hour after take-off. The Boeing 777-ER aircraft was carrying 12 crew members and 227 passengers from 15 nations and regions. The majority of passengers on board were Chinese citizens. As of March 20, 2014, aviation and security experts disagree on whether the plane had a catastrophic failure, such as a fire; or a deliberate attempt of disruption of the flight plan — possibly even involving the flight crew as offenders. Theories on the outcome have ranged from suggestions that the aircraft crashed in the ocean, or was secretly landed in Pakistan, and island, or in a jungle runway in southeast Asia.